Set on a fine silver chain, two open hearts form this simply stylish pendant. With one crafted in silver and the other in rich 9ct rose gold, this otherwise simple pendant boasts a chic two colour finish for a look that is both fresh and contemporary. Finished with sparkling cubic zirconia. 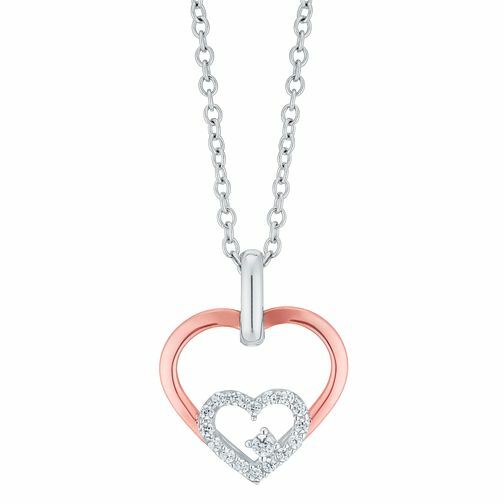 Silver & 9ct Rose Gold Cubic Zirconia Double Heart Pendant is rated 5.0 out of 5 by 1. Rated 5 out of 5 by Anonymous from Perfect bonus gift for my girlfriend Beautiful, well made, and my partner loved it. Thanks.